As the sun sets on an ordinary night, why not take a hike to a 16,000-foot-glacier? This annual pilgrimage for the Lord of Qoyllur Rit’i is an intriguing blend of Catholicism and paying homage to nature deities. Qoyllur Rit’i (Snow Star Festival) is a multi-day event recognized on the UNESCO Intangible Cultural Heritage of Humanity List. The festival is a truly unique experience with intricate costumes synchronized to traditional music that echoes off glacial mountains. The festival begins 58 days after Easter and lasts for a few days around the full moon in June. 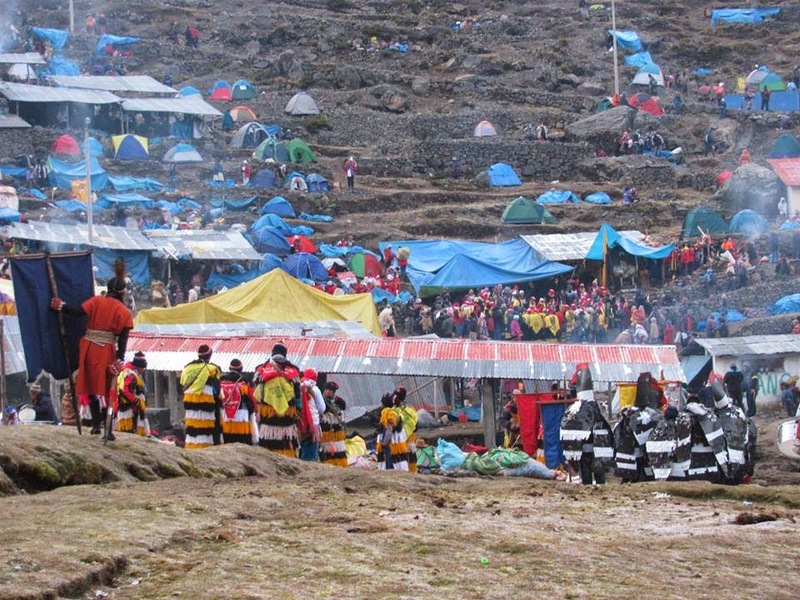 It consists of dancing, costumes, traditional food, rituals for blessing things you have and things you want, and trying to keep warm at the base of the Sinakara glacier, near the Cusco region of Peru. There are two versions of the origins of the festival one from pre-columbian times, and the other is the Catholic version. The first entails a celebration of the Pleiades star constellation that temporarily disappears and reappears every year around the time of the festival representing the disappearance and reappearance of chaos and order. The second involves the son of a sheepherder and a boy with mysteriously fancy clothes who turns into a bush with the body of christ on it. Either way, the locals regard the ice from the glacier to be holy, and lug heavy chunks down each year to ensure a blessed life. You should leave Cusco around 10pm to get on a bus that will take you to the base of the trek. A few hours later you’ll arive to a camp filled with food tents, and people selling flashlights, toilet paper, sweaters and gloves. From there you just follow the massive crowd and start walking. Don’t forget to bundle up in several layers. You’ll embark alongside thousands of locals that will make even the most unreligious soul spiritual. Along the way you’ll pass several stations with crosses and candles where people stop to pay their respects and pray. Try to take in the unique experience as you hike beside a river glistening in moonlight and infinite stars. If you time it just right, you should approach the top just in time to witness the sun peak out over the tips of the snow covered peaks and capture a truly epic sunrise. The next few hours you’ll most likely want to walk around and watch the dancers in their traditional costumes representing characters from mythical stories. Maybe have a parrot choose your fortune, or buy a good luck charm for love, health, and other fortunes. 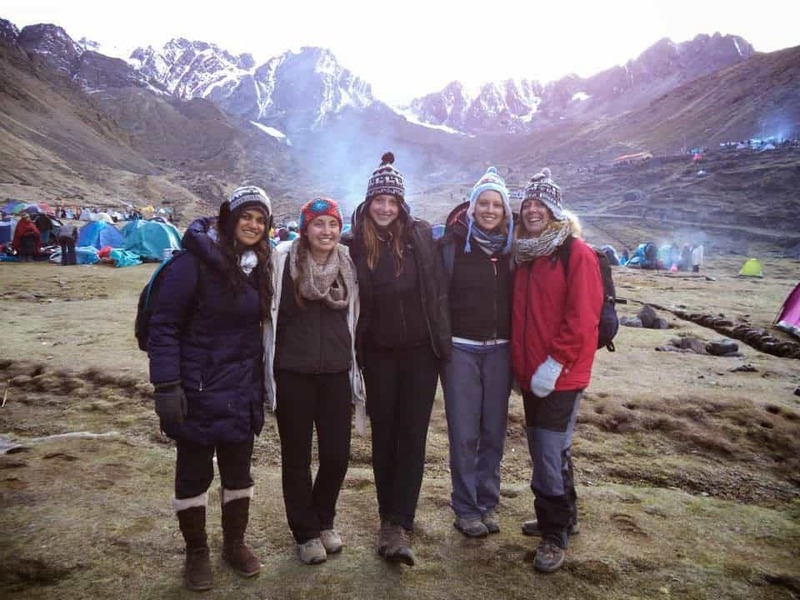 The lack of sleep might begin to overwhelm you on the hike back down, but the musical processions and view of the Andes, will keep your legs moving. As you embark on the journey back to Cusco, you can bask in the memory of colored skirts and icy slopes that will be imprinted on you.